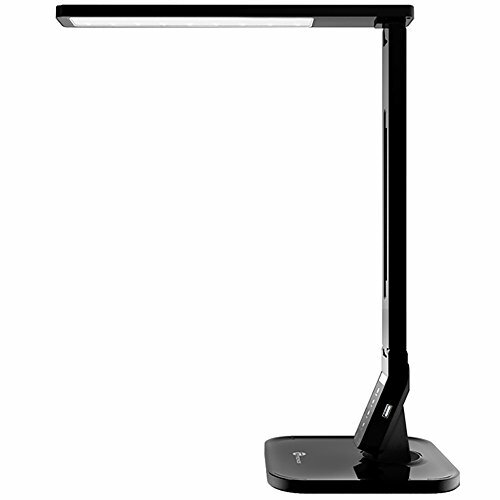 Overview: TaoTronics Elune TT-DL01 (black) is the new generation energy-saving and eco-friendly LED desk lamp. Featuring adjustable mood lighting and five different shades, the elegantly designed Elune is perfect for those late night reading sessions. Built for portability and light sensitive eyes, the Elune is the number one choice for the home, office, study or even the bedside table. Durable: - long lasting LED lights means it's the only lamp you'll need for the next 25 years. - durable hard shell plastic comes in a piano black finish. Convenient: - elegant foldable design, occupies less space. - 18 inch tall, fits well with pc monitor, no glare on screen - 5V/1a USB charging port for your mobile phone or tablet, 60Min auto-off timer - 4 lighting modes: * read: cool white light helps enjoy reading without eyestrain * study: brightest light, ideal for those late night cram sessions * relax: cozy warm light drives stress away * sleep: bathe in the warm light as you nod off -5 level brightness, simply touch the "+/-" to get ideal light what's in the box: - 1 x TaoTronics LED lamp - 1 x Adapter - 1 x cleaning cloth - 1 x quick installation guide.